20-year-old American runs 100m in 9.88 seconds at US Championships. 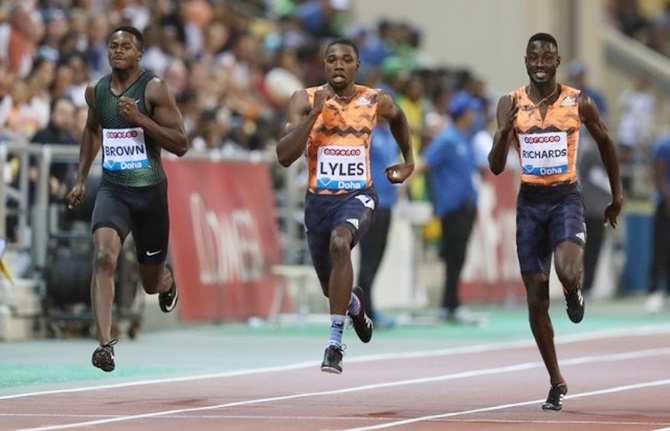 Noah Lyles always wanted to be the next great sprinter after Usain Bolt retired and the 20-year-old American took a big step toward that goal with the year's fastest 100 metres at the US Championships in Iowa on Friday. The 200m specialist, who felt compelled to prove himself at the shorter distance, clocked 9.89 seconds in the semi-finals to tie Mike Rodgers's freshly minted benchmark, then returned about two hours later to run even faster. Lyles capped his US title-winning dash with a lifetime best of 9.88s as he ran down world 60m bronze medallist Ronnie Baker (9.90) to claim victory. "Don't get me wrong. I love the 200. I love it," Lyles told reporters. "But I also like a few hundreds in the mix. "I didn't think that my first USATF championship was going to be a 100 gold medal. I always thought it would be the 200. So to come out here to win the 100, it made me very happy. "It proved... I am out here with the big dogs and I am trying to be just as great as them." Lyles already had a share of the year's fastest 200m (19.69) and bounced up and down on the Drake University track in Des Monies to celebrate his latest achievement. "Coach just gave me the ok to go all out for the final," Lyles had tweeted, and he did just that. Collegiate champion Aleia Hobbs continued her fine season of sprinting by taking the women's title in 10.91 seconds. Ashley Henderson was second in 10.96 with Olympian Jenna Prandini two-hundredths of a second adrift. World record holder Keni Harrison was a clear leader in women's 100m hurdles qualifying, winning her preliminary in 12.46 seconds, and Ajee Wilson topped the women's 800m semi-finals in 1:59.34. Erik Sowinski posted the top men's 800m semi-final time, 1:46:39 and Zach Ziemek won the decathlon with 8,394 points.